And from this sip and another, the narrator embarks on an entire journey of memories: houses, an aunt in the country, streets he ran errands upon, Monsieur Swan, the Square where he ate lunch, country lanes his family walked - the entire village of his childhood. All is brought to life. There is such a strong link between our senses and our memories - to time itself. Sometimes I find myself smelling the wet dust before a storm and I see myself in my father’s garage, awaiting a thunder storm. A few month ago, I dropped my head down to take in the aromas of an Okanagan Pinot Noir and suddenly, I’m 11 years old, at the end of a fishing dock on Rice Lake, outside Peterborough, Ontario. I could even see the rose-tinted sunset in the glass and then closing my eyes, the violet waters. It was evening; I’d stared so long at the water drifting and became so captivated, I fell in (to the comic surprise of my parents looking on). Perhaps this explains our relationship with wine. Like wine, we are exposed to not only the elements, the seasons, but to the hours and years. We are tenuously connected to time. Vintages mean the world to many expert wine buyers. For wine producers, the time to pick the grapes is key. If they wait too long, they risk harvest rains, if they pick too early, under-ripe grapes. Time is a factor. And then there is the time of fermentation, racking (separating the wine from sediment), the time spent in oak and bottles. The time shipped, the time in the wine store, the time of anticipation before opening a bottle, the time we enjoy it with friends and family, and the time we pause and wonder at the different aromas that in turn ask us to search and return to our sensory memories for the corresponding scents and tastes. Wine challenges us to remember, to think, to name, because the aura of these flavours cannot go on namelessly. With time these flavours and characteristics develop just as we develop our own memories throughout the duration of our lives. These thoughts come to me this evening. I take home a bottle of 1992 Riesling Spätlese from the Rheingau. I decide to make schnitzel, slicing up the pork loin, pounding it down, getting the panko crumbs ready, the seasoned flour – rosemary, thyme, basil and a dash of cinnamon. In the background I can hear Beethoven’s Sonata, no.30. I find myself pouring a glass and staring long at the label, not expecting anything. 1992. I taste the honeyed-lemon, the kerosene apple and lush, viscous lemon. The label fascinates me. It is obviously new, placed perhaps within the last few months. But the wine inside. Where was I in 1992? What was I doing when these grapes were harvested? I count back the years. I know I entered high school in 1994 (grade nine). So that meant, I was just entering Junior High Grade 7. The wine is a Spätlese so yes, this means the grapes were harvested later in the season, in mid-to-late October. I was born in October. What was I doing before my birthday? I seem to recall a girl named Erica with whom I walked home one evening. Her mother and mine had been friends once. Memory shifts into memory. I see the autumn swathed streets, fallen leaves, Erica and me. It is the first time I ever walk a girl home. But she isn’t meant to be. At the Hallowe’en dance, a week later, she dances several times with another boy. But - no problem. There’s Sara waiting. I sip the wine and continue to think about the past. For me, Riesling is the wine of harvest. It is the gold of autumn, the apples in their baskets, a sky scented with a far off smell of spices, a mineral soaked wind at a childhood brook. When I drink Riesling, I see only twilights of burnt leaves and suburban sidewalks muted with light afternoon rain. Memory is the colour of gold. I pause, No, that doesn’t seem right. I couldn’t have been that young. It doesn’t make sense. Shaking my head, recalculating the years, I suddenly realize I'm off a year, it wasn’t grade 7, it was grade 8. The remembrance shifts a year ahead. I’m in my parent’s rec room and it’s my birthday party. I am holding a girl named Lori in my arms. She sinks her head down on my shoulder. My eyes briefly water. The song “One” by U2 surrounds us in this brief interlude, flowing through us both as a hermetic guide and a ominous limit to our dance. Bono’s brooding, wincing vocals turn us and my other birthday guests clockwise. It is not like with Sara (I can’t even remember the first song we danced to), in which I awkwardly held her hips, two flat hands against her sides while her limp hands rested on my shoulders, our heads averted; never once did we look into each other’s eyes. No, this is a dance I have lost myself into, the brief respite from my longing for Lori. I am still holding her. How strange to find the year 1992 is still alive in a glass of wine. That such a liquid from grapes grown 17 years ago have found their way into my life and with it, the questions of those years. There’s nothing in my body from 1992. All the cells from that time have died. There are books in libraries published in 1992, but the pages aren’t alive. Memories, yes, but even they change, become distorted, smoothed out because the details are hazed and we only want to remember the good – not the bullies, the tests, the crabby teachers. When wine lovers think of Ontarian wine, the Niagara Region comes to mind first and foremost. While talking about Ice Wine, the name ‘Inniskillin’ of Niagara-on-the-Lake is the first name that springs to experienced palates. Not only that, the Rieslings and Pinot Noirs of such exciting and well-established wineries as Cave Spring, Tawse, Henry of Pelham and Thirty Bench are responsible for putting our offerings on the world wine map. We can boast well over 60 wineries here on the shores of Lake Ontario, but what about the rest of Ontario? This past week I found myself on the northern shores of Lake Erie, making my way along the wine country route, eager to discover some hidden gems and diamonds glistening in the rough. Back in the early 1900s, the region could boast just as many wineries as present day Niagara. Within a decade, the majority closed and tobacco became the new cash crop. Today there are 11 well-established wineries in the Lake Erie North Shore Appellation. The region experiences more sunshine than elsewhere in Canada, with vineyards growing on south and southeast facing slopes and on Pelee Island, 20km south of Leamington (the Island has 243 hectares of vineyard compared to the north shore’s 142). In relationship to other great wine growing regions of the world, the latter appellation lies at 42 degrees which puts it along the same latitude lines of Northern California and Tuscany, Italy. The mainland area is nearly surrounded by water with Lake Erie to the south, the Detroit River to the west and the cool breezes off Lake St. Clair in the northwest providing a moderate, calming effect. But there are some hazards. The precipitation can be higher than average during the growing season and there have been some years when serious winter damage has been hazardous to the vines. Yet the soils here are ideal, with sandy loam and gravel deposits providing good drainage. The effects of the longer growing season have made the region perfect for growing Bordeaux varieties (Cabernet Sauvignon, Merlot, Cabernet Franc) and hybrids such as Baco Noir, Marechal Foch and Vidal for both varietal and Ice Wines. Leamingston is a small city of 30,000 people and is rightly called the Tomato Capital of Canada (the Heinz factory is not easy to miss, looming on both sides of Erie St. between Oak and Morgan – I feel assured now that I know where my ketchup is coming from). The city boasts the largest concentration of greenhouses in North America - they are just about everywhere - with well over a 1000 acres under glass. The agricultural landscape is perhaps the most diverse in Canada and if you’re a bird watcher, there are plenty of places to view the wildlife. Kingsville is a smaller community (population 20,000 plus) and, like Leamington, attracts bird watchers, many of them to the Jack Miner Bird Sanctuary. For nature lovers there is Colasanti’s Tropical Gardens in the community of Ruthven. Between the outskirts of these two cities, you can find three excellent wineries: Aleksander Estate, Mastronardi Estate and Pelee Island. I had a chance to visit the latter two with Pelee Island being the most famous. It is also has the largest estate vineyard in the province. The winery was founded in 1982 by Austrian winemaker, Walter Strehn. Pelee Island’s portfolio is quite expansive with 40 wines to choose from (I had the chance to try 10 wines at ten in the morning… I say a fair sample) made by German winemakers Martin Janz and Walter Schmoranz. I found the Gewürztraminer Reserve reminiscent of the Alsatian styles (lychee, grapefruit and apricot-floral) with a lovely viscous quality. As for the reds, the Bordeaux variety Cabernet Sauvignon does especially well, much better, in my opinion, than in Niagara (we offer excellent Pinot Noir, Cabernet Franc, Riesling and Chardonnay – something to focus on and be proud of). Pelee Island makes excellent ‘Reserve’ line wines but their heavy hitters are The Vinedressers series. The 2003 Meritage has a leafy-cedar-red currant beauty with notes of pencil shavings and a rustic barnyard touch, making it an ideal steak wine. If you prefer New World wines similar to California, the Cabernet Sauvignon/Petit Verdot blend offers a robust vanilla-red fruit chocolate touch. At Mastronardi, I found their 2006 Merlot to have the right balance of acidity and tannin with nuances of chocolate and black fruit. It is a gentle, pensive wine. The 2007 Cabernet Franc is leafy and vegetal with black fruit and chocolate. Simply delicious. I was especially impressed with their 2007 Syrah which reminded me of Chilean Syrah with the black pepper, the black fruit and a curious hint of earthy mint. These wines are fabulous and wine lovers can be thankful that when the brothers Mastronardi bought the land from Colio Estates, they decided not to go into greenhouse production. Like neighboring Kingsville, Harrow is another quiet community with its diverse agriculture taking up the majority of the landscape (I saw a lot of corn, to be honest). Wine lovers should be sure to visit the neighboring wineries which include Colchester Ridge Estate, Viewpoint Estate, Erie Shore Vineyard, Sprucewood Shores, Muscedere Vineyards and Colio Estates. Of these six wineries, it is Colio, (the pioneer of Lake Erie North Shore) that is the largest, not only in the region but in Canada as well, producing nearly a quarter million cases a year. The company’s first winemaker Carlo Negri came to Canada from Friuli in northern Italy in the 1980s, skeptical about our country’s winemaking. In the 1990s, Negri helped launch the CEV (Colio Estate Vineyard) series, making high quality wine worthy of competing with international wines from France and California. Today, Negri has handed over the reigns to Tim Reilly and there is certainly no lapse in character. The Colio Tasting Room and retail shop is located directly in the town of Harrow and situated conveniently on Colio Drive. (The majority of local tasting rooms are found at the wineries along Seacliff Drive). Here you can find a quaint little shop with stained-glass windows and a team of wonderful, helpful staff members. It feels both rustic and yet five-star at the same time. Like Pelee Island, I found their Gewürztraminer similar in style to Alsace with an interesting lighter note of kiwi (reminding me of New Zealand Gewürztraminer). Colio has become famous – or infamous - for their ‘Girls Night Out’ series (first launched in 2008). I highly recommend the Riesling which is less German in style and more New World with notes of apple, peach, pineapple and banana. The Colio Estate series was my personal favourite, offering great value with an excellent varietal Cabernet Franc and a Cabernet Merlot blend. The Cabernet Franc is layered with leafy-green pepper, red fruit, coffee and a vanilla bright acidity. The Cabernet Merlot was my personal favourite, offering black fruit, pencil shavings and violet-cedar finesse. The wine has soul, a balanced nuance I fell quietly in love with. Their Meritage and Pinot Noir from the CEV line were equally good. I feel the Pinot needs a bit more time but the Meritage is drinking great now, a wine to pair with a hearty steak dinner. The Vidal Ice Wine also stole my heart. A honey-apricot treat with apple and pear. This is the kind of dessert wine you want to have with a late night apple cobbler or decadent butter tart. Gail of Colio was helpful and told me about the winery’s plans to expand. The company bought 8 hectares of land near Inniskillin in Niagara-on-the-Lake with the intention to build a winery in the near future. She also informed me there are more wineries slated to open in the region, bringing the number up to fifteen or sixteen. My stay in the region was brief. Travelling with my father and brother, we found the amount of money we spent on the local wines to be well beyond the limits of our budget. After Colio, we headed to historic Amherstburg, a town famous for being the Canadian entry point for many African-American slaves on their journey to freedom. Established in 1796 as a British military fort, there is still an aura of the 19th century to the many buildings along the river. We had a late lunch at an Italian restaurant on the river off Dalhousie. Beleaguered by bees, we ate our sandwiches while my brother and I sobered from the numerous wines we’d sampled that day (I admit, I didn’t spit; I was on vacation). Behind us, couples and families walked along the river side, posing for pictures. A young couple sat on a park bench, eating ice cream cones. The ferry between the mainland and Bois Blanc Island chugged back and forth under a solemn, overcast sky. A cool wind passed under the leaves. For those who love Niagara-on-the-Lake’s village feel, Amherstberg is another ideal tourist point, not only for the Victorian houses and parks, but also for their various festivals, the primary one being held at harvest time in the fall. Between September 10th and 13th, at 100 Laird Avenue, visitors cam enjoy the Shores of Erie International Wine Festival at historic Fort Malden. From Amherstberg, we drove back south and east along Seacliff Dr. I felt my heart sink at the prospect of not checking out any more wineries. I still wanted to visit D’Angelo Estate near Amherstburg, not to mention Sanson Estate in neighbouring McGregor. However, when time and my pocket book allows, I shall return. Phillips, Rod, Ontario Wine Country. North Vancouver, WhiteCap Books, 2006. In-House and Customized Tasting - WineQ specializes in customer-tailored wine tastings for your home, office, or special occasions and events. Whether you'd like a simple tasting or an in-depth seminar - Wine Q can help! Free Estimate - WineQ offers a free, no-obligation consultation/visit. We’ll come to your home or business, discuss your wine event needs and provide you with an estimate for our services. Wine Q 101: "Light and Lively"
- A new world versus old world comparison of reds. Discover how the European reds have influenced, shaped, and now compete against their new world counterparts. - A new world versus old world comparison of whites. Discover how the European whites have influenced, shaped, and now compete against their new world counterparts. 4. Ontario - Yours to Discover...and drink! - Learn how Ontario holds its own against the rest of the world. Try 6 fantastic local wines. - Experience the worldly differences in a single variety of wine. Choose 1 of the noble varieties (Cabernet Sauvignon, Merlot, Syrah/Shiraz, Riesling, Sauvignon Blanc, and Chardonnay) and let WineQ take you around the world. Wine Q 201: "Medium and Mellow"
- Learn the signature grape from 6 countries and its cultural edge in the world wine market. - Choose a country/region from the old world wine market and experience 6 wines. -Choose a country/region from the new world wine market and experience 6 wines. - Compare and contrast 3 Ontario wines to their European brothers. 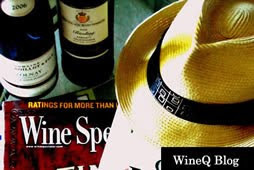 WineQ’s educator, Robert Broerse, studied with Wine & Spirit Education Trust (WSET). Robert has ten years of experience in the wine, food and restaurant industry as well as extensive experience providing wine education seminars in partnership with British Columbia’s largest wine store – Everything Wine. Robert continues to broaden his knowledge of wine through his research of the historical, cultural, philosophical and sensory attributes of wine.